The symposium was held in the spacious lecture hall of the New Academic Building. It kicked off with Naut Humon’s keynote. He began with recollections of crazy psychedelic performances and happenings from the 70s, the likes of which Secret Cinema and Punchdrunk may be trying to emulate now. He then introduced the CineChamber, the exciting project from Recombinant Medial Labs of which he is a founder and artistic director. The CineChamber is a mobile scalable surround-screen structure capable of immersing audiences in 360º of audiovisuals. He has taken it to numerous locations and festivals including Mutek and Transmediale. We very much hope to see this impressive setup soon! 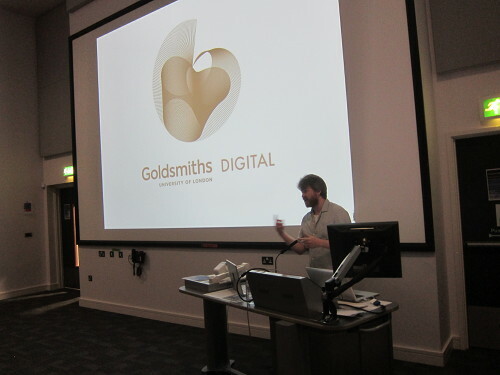 Mick Grierson (Goldsmiths) followed with a presentation on his three-year old project: Sound, Image and Brain, that has lead to numerous developments involving industries and the public sector. He recounted his personal journey from experimental music, to experimental film and video, and then ways of controlling them through brain-computer interfaces. The outputs have been wide-ranging, from extending the creative potential of audiovisual art to practical applications such as working with people with disabilities. Next was Nuno Correia (Aalto University, Helsinki), who introduced us to his custom-made audio-visual platforms for live performances. Many of these are web-based and available for others to try out and use themselves. He also uses his tools for his own creative projects, one of which was the Master and the Margarita, an interesting mix of his roots in clubbing with Bulgakov’s twisted world. 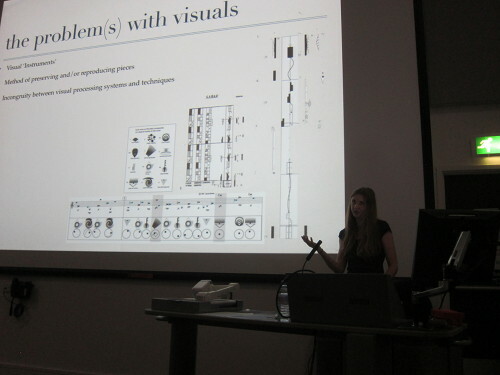 Anna Weisling (University of Wisconsin) recounted her own attempts at a notation system for transcribing her visual performances so that others may be able to recreate them. After the break, Freida Abtan (Goldsmiths) gave a presentation entitled “Expanded Presence And Inter-Sensory Gesture In Multimedia Performance”, exploring possible perceptual relationships between a live dancer and screen-based visuals. She is also planning live performances of such works in the near future. 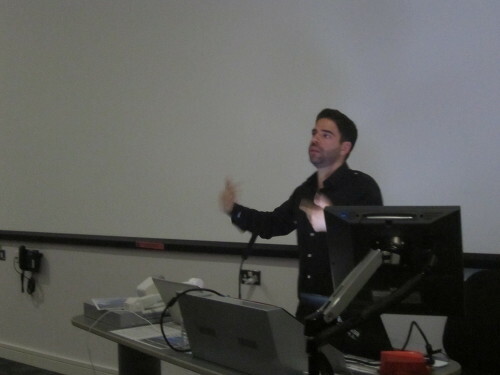 Toby Heys (MIRIAD at Manchester Metropolitan University) followed with an account of his developing project with Steve Goodman aka Kode9. This involves investigating the use of sound as a weapon – see Goodman’s Sonic Warfare – and the concept of hauntology as posed by Ian Penman in reference to Tricky and developed by Mark Fischer. 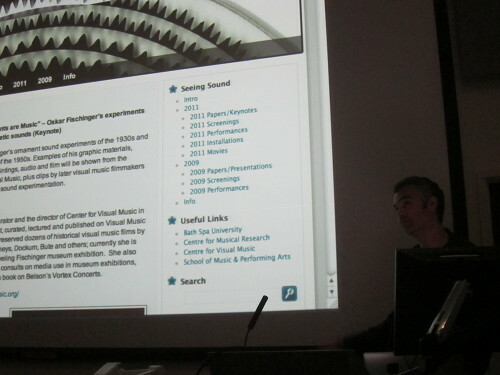 Joseph Hyde (Bath Spa University) introduced the Seeing Sound Research Network which has a similar agenda to Real-Time Visuals, but perhaps with more of a focus on historical aspects such as visual music. A few of us have attended and presented at past symposiums and concerts which have been informative and fun. The next event should be taking place in December this year. 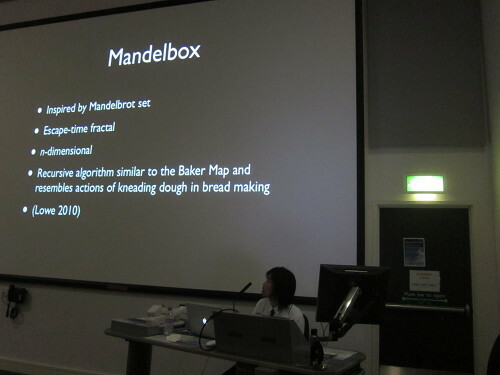 The last session began with my presentation entitled “The Live Audiovisualisation of a 3D Mandelbox”. Audiovisualisation is the simultaneous sonification and visualisation of the same data. 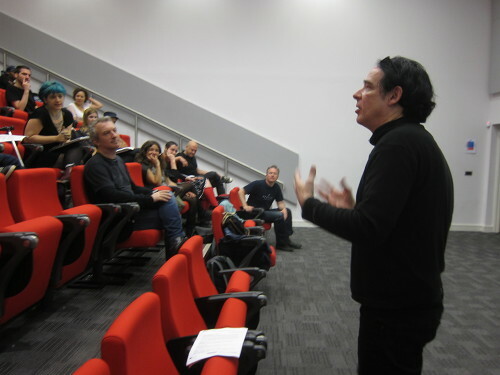 Its relation to older analogue forms such as Structural/Materialist film was discussed. My fixed-media work Composition: White Square. White Circle was also shown on a big screen for the first time. 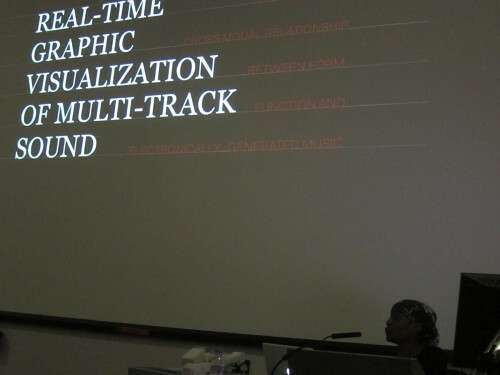 Next, Ireti Olowe (Queen Mary University of London) gave us her presentation entitled “New Approaches to the Sound Visualization of N-Track Non-Notated Electronic Music”. This is a subject area being researched for her PhD, and she introduced us to topics such as track separation, audio analysis and visualisation techniques. 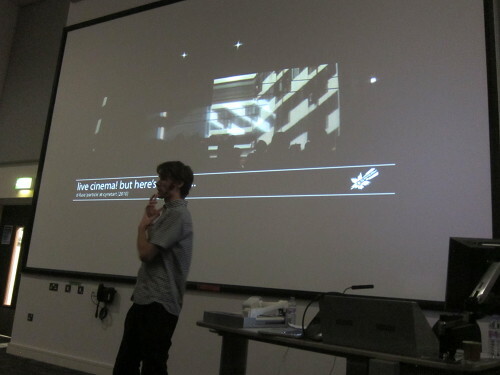 Toby Harris (Queen Mary University of London)’s talk “About the Live in Live Cinema” was described as a project around his PhD. Beginning with accounts of his VJ performances in D-Fuse, issues concerning liveness that also relate to all manner of performances involving computers were raised.